The Dutch IPSC Open Rifle Team (Website / Facebook) is a great group of guys who shoot JP rifles and shoot them often. During the preparations for the European Rifle Championship, the Dutch team designed and published some basic skill-building drills from their training schedule that are suited to a larger audience, including American 3-Gun shooters. Members of the team were good enough to translate these drills into English so we could share them here. Practiced with regularity, these drills will help provide improvements in the skills and observations needed to excel at top-notch rifle shooting. These drills were designed for quick and easy setup. Their focus is on developing a single skill or at most two related skills. Measurements have been converted to approximate yards. Start on A or B. Shoot left side of left barricade or right side of right barricade at 45 meters (50 yards). Two hits per target. Transition to alternate side barricade and repeat. 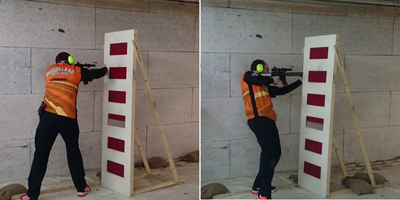 Transition to center barricade at 30 meters (33 yards) from targets. Two shots per target through small horizontal port. Starting at A or B? If you shoot one position weak shoulder, this may be a factor to consider. Most people gain time by starting with the weak shoulder position. Apart from that, moving to a position on your strong side is a bit easier, particularly if you have a heavy-barrel rifle. Body positioning at the low port is important. Kneeling is the most stable but takes more time than squatting. Find out if your accuracy while squatting in enough to produce fast accurate hits. Transition to opposite barrier and repeat. This drill stresses quick positioning after moving to new shooting position—getting a feel for the right balance between speed and accuracy when getting into different shooting positions. Even though the apertures are at different heights, you'll want to maintain the same position of the upper body and head as much as possible at each position. The low positions require a "low standing" posture that can be achieved by bending the knees and getting into a crouching position. Try to avoid bending your back forward at all times. This will deliver maximum speed and consistency! Low ports require kneeling or crouching. Your preference may be determined by your physical ability. If you can bear it, keep in mind that getting up from a crouch is much faster than from a kneeling position. Since your movement between shooting positions will be explosive, it's easy to forget to breathe during shooting. Oxygen depletion is an important factor. Consciously breathe well during movement and train on breathing while shooting! The mandatory order in which the apertures must be used forces the shooter to use his/her conscious mind for other things than shooting. The result is a nice diagnosis of skills that are not yet fully ingrained in your subconscious mind. You'll pick these out because they'll be your fail points during the drill. While executing the drill, use your focus for the immediate next task only! That is, during movement, leave the targets alone and focus on the exact spot you want your feet to land at the next shooting position. Control yourself! Perfect execution is crucial, and that involves good hits. C and D are not acceptable, so stop yourself from rushing even though the distance is small. Targets: 1 x Classic Target, 1 Classic Target with No Shoot with top on the shoulder line of CT.
From A, fire ten shots at the full target. Transition immediately to ten shots on the partial target. This drill is about getting clear and consistent target acquisition by not mixing in movement. Become hyper alert for the start signal. Establish a consistent way of holding the rifle in standby and firing position. Mount the rifle right the first time! On the partial target, more accuracy is needed. Focus on accuracy before speed. Don't wait for the start signal to cease. It may sound as long as half a second, which means you throw away at least 3/10 of a second by waiting for the beep to end. Maintain focus on the target during the drill. The scope will come enter your peripheral vision. Once the rifle stock is properly seated in your shoulder, you should have established a workable sight picture. Finding your proper starting position can be achieved by reverse engineering. First, establish a solid shooting position and lower the rifle by only moving your arms. Take extreme caution not to change the position of the shoulders and head. On the beep, you can then simply lift your arms in a fluid economical way and shoot as soon as you have regained the previous posture. Really push yourself for A-zone hits. However, don't freeze up and shoot only dead center As. You will learn to recognize what sight picture is sufficient for an A and which is not.